In the final quarter of the 18th century, Abbot Václav Mayer decided to build new library space for the numerous additions to the library. To this end, he had the current Philosophical Hall built on the site of a granary by Jan Ignác Palliardi, an Italian architect naturalized in Bohemia. The façade was built in 1783, but after the advantageous purchase of a walnut interior for the library, relocated from the abolished Premonstratensian monastery in Louka by Znojmo, he adapted the dimensions of the future hall to the size of the shelves. The interior was installed in 1794-1797 by its original designer, Jan Lahofer of Tasovice, and modified to an Early Classicist Style. The amazing size of the hall (length: 32 m, width: 22 m, height: 14 m) is compounded by the monumental ceiling fresco by Viennese painter Anton Maulbertsch, painted over six months in 1794 with the help of just one assistant. The highest rows of books are only accessible from the gallery; hidden spiral staircases, masked with false book spines, lead up to the corners of the gallery. The fresco 'Intellectual Progress of Mankind' is a concise depiction of developments in science and religion, their mutual impact on each other, and quests for knowledge from the oldest times until the time the hall was built. The basis and locality of true wisdom can be found in Christianity. Divine Providence, surrounded with virtues and vices, is set in the centre of the fresco as a guarantee of this search for wisdom. The development of mankind starts with its dawn, which is understandably linked with Old Testament motifs. In the centre of these events are panels with the Decalogue, and Moses, behind which is the Ark of the Covenant. Others depicted here are Adam and Eve, Cain and Abel, Noah, Solomon, and David. On the left-hand side we can track the development of Greek civilization, from mythical times, to the time of Alexander the Great (portrayed in the presence of his teacher Aristotle), right through to the philosophers Socrates, Diogenes, and Democritos. The evolution of science is illustrated on the right-hand side (e.g. Aesculapos, Pythagoras, Socrates in prison). 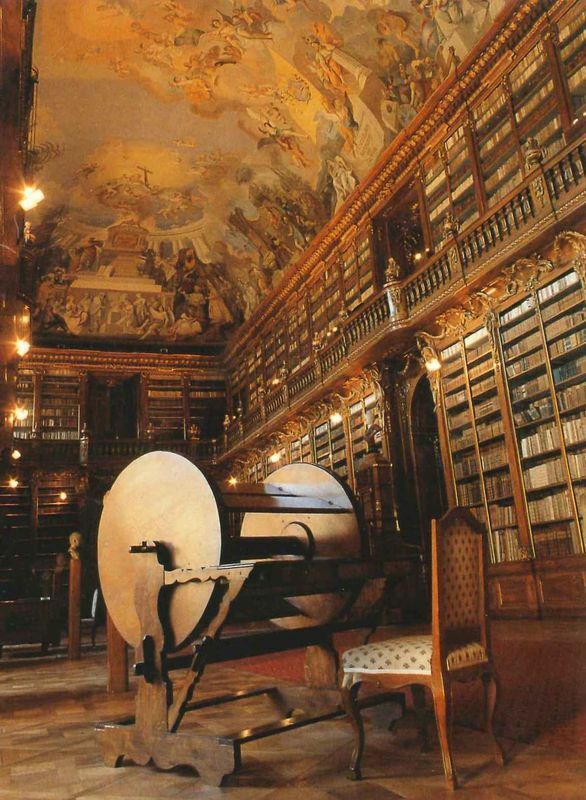 By the legend 'Wenceslaus secundus, hic primus', which tells us that the founder of the hall, Václav Mayer, was the second abbot to be named Václav, but the first Václav in the library, there is a group of defeated misbelievers as an allusion to the French encyclopaedists. Their Encyclopaedia is, however, stored in the hall among the first volumes, which indicates the liberalness of the then atmosphere in Strahov. The opposite side is dominated especially New Testament scene of St Paul's speech at the monument of unknown god on Areopagus in Athens. Wenceslas, Patron Saint of Bohemia, stands in the right-hand corner, a banner with the Eagle of St Wenceslas swaying in his left hand. The old woman on his right is his grandmother, St Ludmila. Underneath him, among the four Fathers of the Church (Jerome, Ambrose, Augustine, and Gregory) stand St Methodius, who christianized Great Moravia Empire, and the second Bishop of Prague, St Adalbert. The last in the line, with an enlightened face and holding his abbot's croizer, the founder of the hall, Abbot Václav Mayer, peers into the hall. To his right, other Bohemian patron saints, St John of Nepomuk and St Norbert (the founder of the Premonstratensian Order) are kneeling. 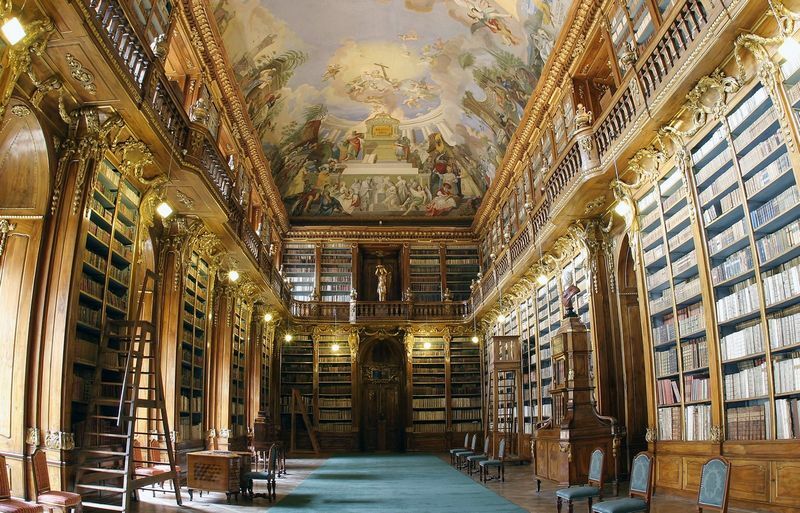 At the end of the 18th century and beginning of the 19th century, the library became famous throughout European cultural circles. Numerous visits by important people are recorded in the oldest visitors book first used in 1792. Women were initially only allowed to enter the library sporadically because of the imposition of monastic seclusion. One of the first was, surprisingly, Lady Emma Hamilton, who visited the library in 1800 with her husband, the British archaeologist and statesman Sir William Hamilton, and her lover, the victor of the Battle of Trafalgar, Admiral Lord Horatio Nelson. Another significant woman to enter the library, on 17 June 1812, was the Austrian Princess and wife of Napoleon Bonaparte Marie Louise. 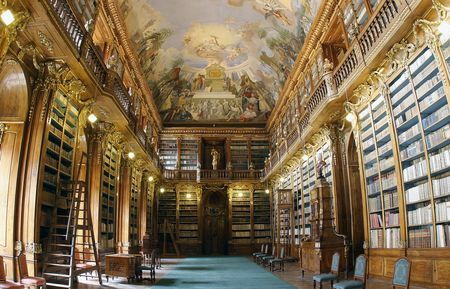 In the autumn of the same year, she sent Strahov Library more books, a Viennese set of porcelain, and, most significantly, a four-volume work on the first Louvre museum. When this exclusive publication had been completed, Napoleon is said to have ordered the whole print run to be destroyed, and kept just three or four complete series. He was afraid that his reputation would be ruined by the fact that the work listed the origin of a whole number of exhibits, looted in the main in Italy. This gift was stored in a special high cabinet overlooking the other furniture in the hall. Opposite the entrance doors, on the other side of the hall, there is a bust of the Strahov librarian and archivist Prior Cyril Straka, who made a substantial contribution to the cataloguing work and to the process of making the library and archival materials available to the public, primarily in the first quarter of the 20th century. He was also one of the foremost experts on Czech bookbinding. It was Straka who named the two halls after traditional separate philosophical and theological study subjects. In addition to philosophy, which originally included all the sciences, we can also find works from other disciplines which were taught at universities in the scope of courses on philosophy: astronomy, mathematics, history, philology, etc. There are more than 42,000 volumes in this hall.